Shiawassee County was set off in 1822, and organized in 1837. It is a mostly farming county of rolling plains and about 71,000 people, nestled between Lansing, Flint, and Saginaw. It is named for its principal river, the Shiawassee River, which was used by the tribes as a canoe route to get to the Saginaw River according to David M. Brown's Michigan County Atlas. The name of river, he says, is thought to translate to "it runs backwards and forwards," or "the river that twists about." There is archaeological evidence of human habitation in Shiawassee County going back 2,000 years. The Ojibwe people lived here and did battle with their enemies, the Sauk tribe, eventually expelling them from the region sometime before 1790 AD. Fur trader Henry Bolieu set up a temporary trading post on the river in 1816, Brown says, prior to the Treaty of Saginaw (1819). European settlement began in 1836, mostly subsistence farmers. Among the first settlers of Shiawassee County were the first settlers of what became the city of Corunna; John Davids and his family from New York arrived here in 1836. The first post office was established here in 1838, and Corrunna became the Shiawassee County seat in 1840. The town is thought to be named after A Coruña (Corunna), Spain, since one of its founders, Andrew Mack, was a sheep herder in the Cumberlands area of Spain before he emigrated to the U.S. at age 24. These are the ruins of an old grist mill that once sat along the Shiawassee River in Corunna. 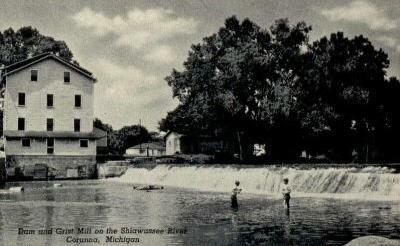 I found a historic photo of the mill that used to stand here at shiawasseehistory.com, though it does not give a name to the mill. This dam powered it for over a century at any rate, up until the mill burned down in the 1950s. So then I suppose we can assume that the mill was built in the 1850s. The webpage says that in 2001, a safety inspection showed that this dam was in poor condition and posed a hazard, although it was unknown who actually owned the dam and was responsible for it. Several people have drowned here over the past 150 years, but it "remains a favorite fishing spot," and is the site of a popular city park on the west riverbank where I was currently sitting and enjoying the scenery. The nearby city of Owosso is Corunna's bigger cousin, sometimes known as the steam railroading capitol of the U.S. and the home of the Polar Express, made famous by the popular movie of that same title. Reliance was one of the companies that were later merged to form GMC. Owosso almost became the manufacturing headquarters for GMC, but according to shiawasseehistory.com, the plan was changed at the last minute and the city of Pontiac was chosen instead (I explored that plant in an older post). This plant was then used by American Malleables in the 1940s, and finally the Mid-West Abrasive Co., who made sandpaper "in sheets, rolls, and discs." I never did successfully find a way into this plant, and I think it is still used in some capacity. David M. Brown says that Owosso was named after the Ojibwa Chief Wasso, or Wassau (meaning "far off"), who was the signer of four treaties with the United States. "Local folklore recalls the Legend of Owosso," Brown writes, which told how an Ojibwa chief adopted into his tribe a Sauk fugitive named Bukadawin, who then married the chief's daughter, Natomo, who bore a son. The Sauk had been the enemies of the Ojibwe since time immemorial, and this clearly was not forgotten by all in Natomo's village. One day an Ojibwa brave named Spotted Snake "drew his bow with poisoned arrow," intending to slay Bukadawin. Natomo saw this and jumped in front of the shot, being killed. Bukadawin named the son "Wasso," meaning "one bright spot," referring to the fact that his son was the one remaining joy in his life thereafter. This freighthouse at 524 S. Washington is actually listed in the Historic American Engineering Record (HAER), and sits next to the handsome old Grand Trunk Western RR passenger depot along the rail line that goes to the city of Durand, on the way to Flint. Durand is another big railroading town, which seems almost to be built for trains rather than cars. The HAER states that both the Owosso depot and this freighthouse were built in 1900, and are a good surviving example of the depots that were built to serve Michigan's medium-sized towns during this era. Curwood used the top of the tall turret to do all of his writing, until his death in 1927. Today it is a museum to the legacy of the prominent author and conservationist. Although the cabin has been moved three times, it is still made of its original logs. There is also a large vacant historic sugar mill to be seen in Owosso, but I haven't been there yet. There's a Corunna in Ontario across from Marysville & I always thought it to be a funny name. Interesting to learn the origin.